Captain Carlisle was the aircraft commander of a B-29A Superfortress Bomber with the 344th Bomber Squadron, 998th Bomber Wing. On February 28, 1952, while on a bombing mission, the aircraft's engines developed problems and the crew bailed out. He was listed as Missing in Action and was presumed dead on December 31, 1953. Captain Carlisle was awarded the Air Medal, the Purple Heart, the Korean Service Medal, the United Nations Service Medal and the National Defense Service Medal. The family of Air Force Captain Osborne T. Carlisle waited most of a lifetime hoping for his return from a war fought more than half a century ago. For many years after Carlisle's B-29 bomber went down over Korea one day after his 35th birthday in 1952, family members clung to the belief he might still be alive. And they kept on believing it, even after they stopped saying so out loud. Yesterday, Carlisle's three daughters laid that hope to rest once and for all at Arlington National Cemetery. A memorial service for Carlisle was held on a hillside reserved for headstones bearing the names of servicemen and women killed in action but whose remains have never been found. His daughters and grandchildren walked through Arlington behind a caisson bearing an empty casket and an honor guard carrying a black-and-white POW/MIA flag. They wiped away tears as a bugler played taps and 21 shots were fired into the air. Then they walked up the hill and hugged before his headstone engraved with the words, "In memory of." "We know he's dead," said Carlisle's oldest daughter, Karen Carlisle, who lives in Portland, Ore. "Nothing would be as good as getting his remains. But this is next to best." The memorial service for Carlisle is one of four scheduled for Air Force men who died in the Korean War but whose bodies have never been recovered. Services for Captain Ara Mooradian and Technical Sergeant William J. Botter were yesterday as well. On Monday, there will be a service for Lieutenant Colonel Gerald E. Montgomery. It is unusual for Arlington to have four funerals for Korean War casualties so close together. But this weekend, more than 500 surviving family members of MIAs from the Korean War are meeting in Tysons Corner for an update on the military's efforts to locate the remains and bring them home. Fifty-one years after the Korean War ended, more than 8,100 servicemen are still listed as missing in action. That compares with more than 1,800 missing from Vietnam and 78,000 from World War II. It is not for lack of trying to find their remains. Since 1996, teams of experts, including anthropologists, have traveled to North Korea to scour sites where U.S. soldiers recall burying their fallen comrades or where POW camps were reportedly located. They have brought out the remains of 180 men believed to be Americans. The remains of U.S. MIAs have been gathered and repatriated from Korea since 1954, during a postwar exchange of prisoners and bodies. About 800 could not be identified and were buried as unknown soldiers in a military cemetery in Hawaii. Between 1991 and 1994, North Korea turned over an additional 208 sets of remains said to be Americans. But only seven could be identified, so the United States negotiated permission to send in teams to visit the sites and recover the remains themselves. A team is in North Korea now, looking at battlegrounds from 1950 in Unsan and the Chosin Reservoir. So far, the North Koreans have not permitted the teams to speak with four U.S. deserters still living there, said Larry Greer, a spokesman for the Pentagon's POW/MIA office. Investigators would like to ask the deserters to shed light on occasional stories that emerge of Americans being held against their will in North Korea, he said. During the Korean War, captured U.S. pilots were routinely interrogated about their aircraft. But most of the rumors of Americans purportedly sighted alive in North Korea have been traced to the deserters, Greer said. Carlisle's fate remains a mystery. He was commander of a B-29 that left Yokota Air Base in Japan on the afternoon of Feb. 28, 1952, according to Air Force documents. Engine No. 2 was losing oil and spewing smoke even on takeoff, recalled Lloyd Smith, who was the left gunner in the rear of the plane that day. The same problem three days earlier had caused Carlisle to abort the mission so the engine could be repaired, Smith said in a telephone interview. This time, Carlisle kept going. The plane was between Seoul and the open sea when the leaky engine burst into flames, said Joseph Manion, the flight bombardier. The crew jettisoned its payload over land and Carlisle gave the order to bail out somewhere over the forward combat lines. Seven crew members were quickly rescued. The remains of two crew members eventually were recovered. But Carlisle and two others were never seen again. Neither Smith nor Manion knows for certain what happened after they parachuted from the fiery plane into the night sky. Smith said he always assumed Carlisle died. Manion believes he may have survived. "If he bailed out, he might have lived," Manion said. "He could have handled being a prisoner better than others. He had the maturity and the attitude. If anyone would have survived being a prisoner, he would have." Back home in Texas, Carlisle's family refused to accept his death. His wife, Patricia, kept writing him letters, dozens over the years, and tucking them away to hand him the day he came home. "We are all hoping and praying that you will be among those released," she wrote in a letter dated Aug. 21, 1953, one month after the signing of the Korean Armistice. "Please come home to us soon." His devastated daughters -- Karen, then 8; Sandra, then 7; and Lisa, then 6 -- grew up believing he could walk through the door any day. "I thought if I didn't keep thinking about him and he was still alive, he would feel deserted," said the youngest, now Lisa Carlise. She lives near Phoenix, as does middle sister Sandra Gonzales. The three sisters usually awoke saying to themselves, "Maybe Daddy will come home today." "Many individual days turned into many months, and then it was 10 years," said Karen Carlisle. "That year, my grandfather died of a broken heart. He had stopped hoping. That was the first time I'd cried. I was 20. To cry was to accept that he wasn't coming home. But I didn't stop hoping, though I quit talking about it." Their hopes were not totally without foundation. Carlisle's older sister, Laverne Morrison, said one of the returning crew members once told her about an unconfirmed report that someone had seen him alive. While the stories they heard over the years never produced solid leads, they offered just enough plausibility to keep the family from abandoning all hope. Thora Carlisle, his younger sister, recalled that no bodies were found at the crash site. Nearby were ashes from a small fire and a photograph of the girlfriend of one of the other missing crewmen, presumably a clue left behind. "We assumed he made it out alive," she said. "There was reason to have hope, not to let your mind even think about closing that door." But at some point, the hope began to ebb. Daughter Sandra Gonzales prayed he wasn't alive because she did not want him to have suffered. Patricia Carlisle eventually remarried. "But she still talked about Dad all the time, like he was still living," said Karen Carlisle. Over the years, old heartaches would rise to the surface every time U.S. troops were sent into combat. Karen Carlisle recalled watching news coverage of U.S. POWs deplaning after being released from North Vietnamese prison camps. "I stared at every face, wondering if one of them might be my dad," she said. "Irrational, I know. Wrong war. Wrong homecoming." Gonzales, the middle daughter, today watches news from Iraq with a familiar sense of dread. "I feel for every child going through this today and what they will have to go through in the future," she said. The turning point for the Carlisle family came shortly after the 1995 dedication of the Korean War Memorial. 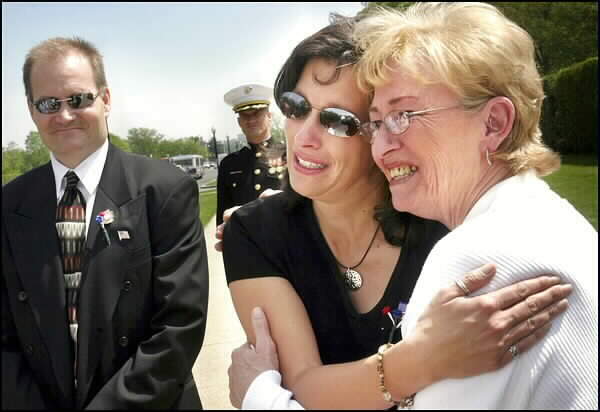 The sisters flew to Washington to place a photograph of their father at the foot of the memorial. While there, they visited a tent in which military records could be reviewed on computers. They called up their father's name. He was listed as dead. About that time, the Pentagon began to hold annual update meetings for families of men missing from the Korean War. While attending one, the sisters heard about the program under which memorial headstones for MIAs can be erected in any military cemetery. They chose Arlington and timed the ceremony to coincide with this year's meeting. Three grandchildren Carlisle never had a chance to hold in his arms know what the day meant for their mothers. "It's been torture for her and my aunts not knowing what happened to their father," Danielle Miller said, putting her arms around the shoulders of her mother, Lisa Carlise. Thora Carlisle said that after 51 years, a memorial service is as much about helping her nieces heal as honoring her big brother. "I would think he would say he'd be proud of that headstone," she said. "That he'd rather not have had it. But I think he's looking down saying: 'Boy, I'm going out in a big way.' "